Do you know this feeling when you wake up in the morning and have a huge craving for sushi? No??? Ok, maybe it's just me and I should change my blog's name to Sushiholic! 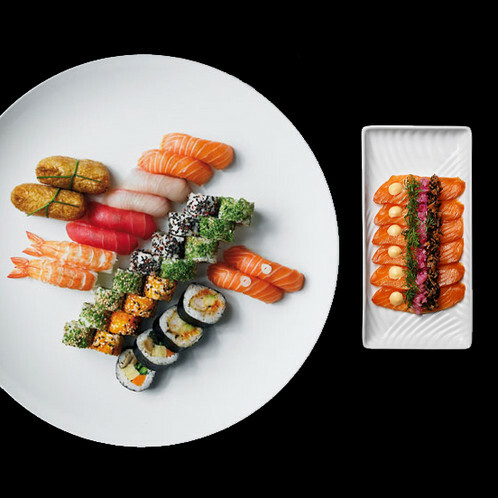 Anyway, the best place to satisfy your sushi cravings is in Wimbledon and is called Sticks n Sushi. Luckily they serve the menu all day long as we arrived for a late (very late) lunch. The menu is full of fantastic dishes, many still remain there for me to try, we had sashimi lux and salmon and friends. The previous late lunch was table for 2 sushi with additional choice. I also recommend great espresso coffee and chocolate bites for light dessert. That fed two very hungry sushi addicts, one ate more than the other, I think you can guess which one. The food arrives super fresh and beautifully presented and the staff is very friendly and helpful. I am hoping to go to Sticks and Sushi soon for an evening meal to see the ambiance and try more dishes. If you happend to live in or close Wimbledon, you are in luck, if not it is worth travelling to.